FANBOY PLANET.com . 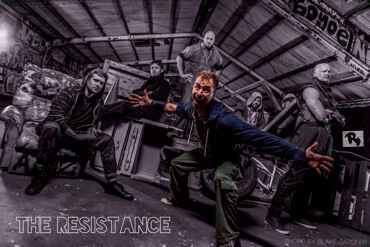 : mc-resistance-review :. Can You Face The Resistance? Don't worry about spoilers, because chances are, none of you will get to see Duffles, or Tommy the Tulip, or any of the mobsters and police officers that faced off against each other Sunday night. But you will see the six actors who played them and many other characters, including the unlikely sight of Derek Mears as a ninja-hooded floozy. 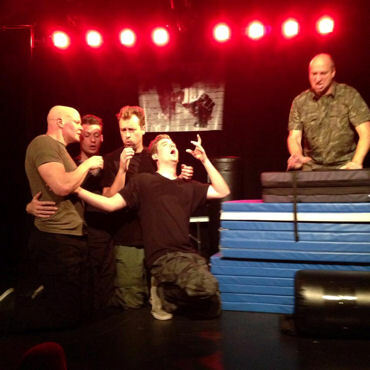 Every Sunday night at the ComedySportz Theater in Hollywood, Marsico, Mathieu, Mears, Kurt Scholler, Justin Michael Terry and Kurt David Maloney gather to create a brand-new action movie. 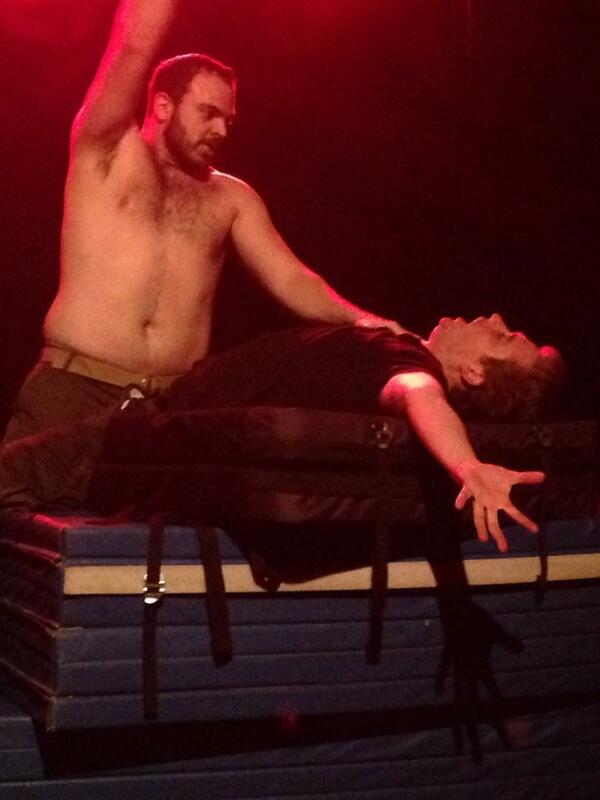 You've never seen it before, and you never will again, because it's improvised, live. 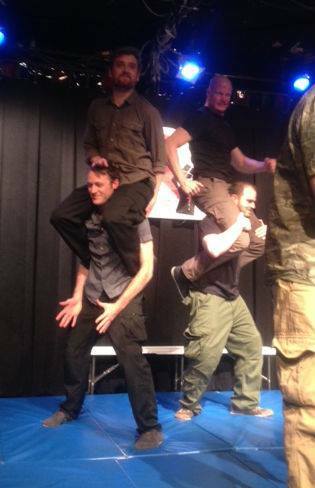 Aside from being at the top of their game as improvisers, what sets The Resistance apart is how physical their show will be. Instead of the standard improv chairs, the group uses wrestling mats, pads and benches to create their environment, and make sure that if you're expecting an action movie, you're going to see ACTION. Derek Mears would be the ensemble member most familiar, thanks to his high-profile (and action-heavy) roles as Jason Voorhees and Master at Arms in Pirates of the Caribbean: On Stranger Tides. But under the leadership of Mathieu, this really is an ensemble, actors tossing focus to each other, tight-knit and playing to everybody's strengths. The audience chooses which specific genre they will see, thanks to a NERF dartboard. Once a genre of film gets chosen, it is taken off the board for a while, to ensure that The Resistance stays fresh. One possible exception to that would be horror film -- not just because of Mears, but because so many variations can be within it, and who wants to see anything else in October? This past Sunday night, the audience chose gangster film. In a direct line that Hollywood executives would envy, The Resistance asked exactly what the customers expected to see: dames, endless bullet casings dropping from tommy guns, betrayal and much, much more shouted out by the movie fans. Even the specific request for the Maltese Falcon came back around, as Justin Michael Terry embodied the fabled black bird in a museum heist scene. It never figured any larger than "hey, it's the Maltese Falcon!" but somehow that attention to detail just made the whole scene funnier. There were mob hits -- so over-the-top violent that Brian DePalma would envy, as Marsico shot Mears so incessantly that all that was left was his shirt. At one point, even the audience got into the game, as Maloney dubbed us all members of the Chicago/New York Police Academy (the cities merged for the duration of this "movie"). Our raid on Tommy the Tulip's lair ended tragically, as the mob simply had bigger guns and endless bullets. But it's amazing to watch an audience get so into it that they act out their own demise. After the show, Mears recalled an earlier slasher movie night, when one of the Resistance quietly killed off the back row, who all played along perfectly. When the rest of the audience turned around to see, they were startled and thrilled to see the killer had been in the theater all along! But as should be expected, The Resistance may tread into R territory, but not gratuitously. These guys absolutely serve the material as they create it. Occasional meta-commentary seeps through, but only in service to the group's stated goal: to PLAY! And you should play, too. For a measly $10 ($8 in advance), you're going to get as much punch as a Hollywood blockbuster, and we'll guarantee you'll leave feeling more satisfied. Honestly, I laughed so hard I thought I had asthma. That's a good thing. For those who sniff at action films, also note that ComedySportz also offers a Downton Abbey riff -- Mannerhouse Manor -- on Friday nights and the sporadic Chickspeare -- an all-female cast creating the effect of a Shakespeare Festival. When: Sunday nights, check website for showtime -- 9:30 in January, may be 9 p.m. after.